A General Chart of the River Hoogly and the Approaches to it from False Point to Calcutta, Compiled from the Surveys of Captn. Lloyd, and his Assistants, by John Walker. 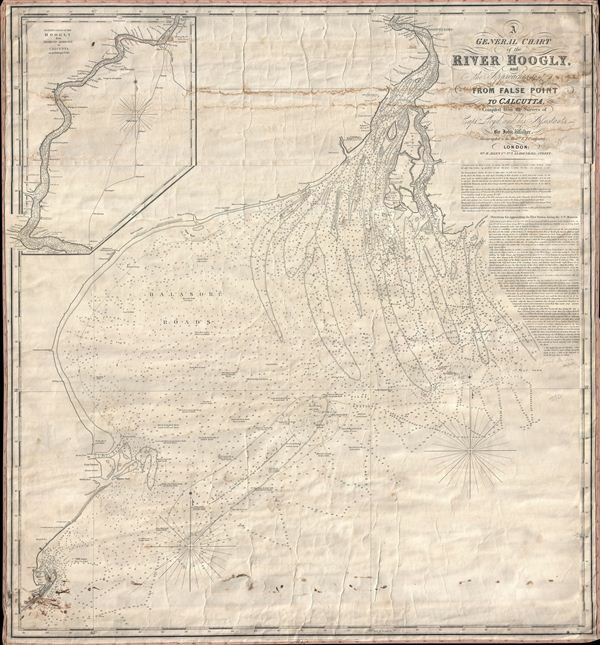 A scarce 1850 blueback nautical chart of the Hooghly River, West Bengal, India by John Walker. The chart covers the mouth of The Hooghly and the Bay of Bengal as far a south as False Point. An inset in the upper left quadrant continues to follow the course of the Hooghly as far north as Calcutta (Kolkata). The chart offers countless depth sounds, sailing instructions, and notes on offshore dangers, shoals, and other practical information for the mariner. The Hooghly us a navigable distributary of the Ganges River. The river was an important trade artery in the colonial period and was partially responsible for the British establishing themselves at Calcutta. This chart is extremely scarce and we have identified no other examples offered in recent history. Average. Chart has some creasing and staining at top. Linen backing and edging intact but exhibit wear. A good candidate for restoration work.